I will be almost completely offline for a few days but fear not. I will be back next week with more posts. 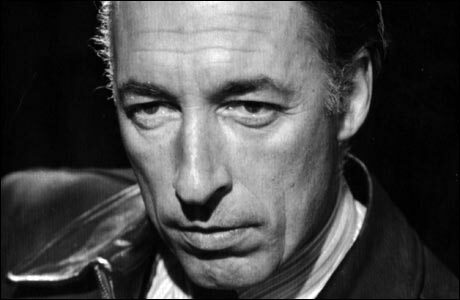 Meanwhile, enjoy your weekend and, since it’s Father’s Day, here in the US, you might want to take a moment to remember your dad. 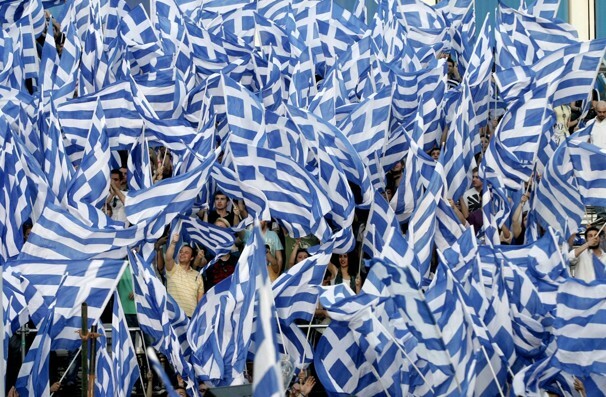 On Sunday, June 17, Greeks will vote for the second time in about a month. The last national election results seemed almost humorously irrational to the outside world; for example, putting both socialists and neo-Nazis into parliamentary seats. 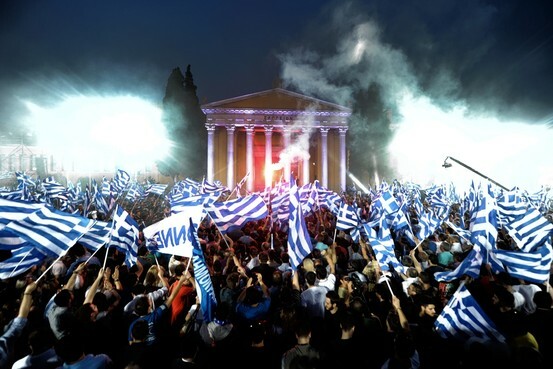 It wasn’t, of course, either funny or irrational from the perspective of the Greek people, who felt themselves lied to by their own political and business leaders and by global financial interests, leaving them with a burning anger and the unpaid bill for quite a spending party. After the May elections, no party could form a government, so the nation will go to the polls again. But there’s no laughing this time around. Not anywhere. The stakes are quite serious, indeed. Greeks must decide whether they’ll stay in the Eurozone and, if so, who will bear the burden. Markets are trembling and tough talk from some quarters, especially among Europe’s so-called leaders, has done nothing of benefit to anyone. Financial analysts, governments and politicians everywhere are watching closely what the Greek people will decide about their future – stay or go, accept Eurozone-mandated austerity measures, radically change the nature of Greek social programs. In any case, there will be worldwide ripple effects, in addition to perhaps seismic changes within Greece itself. Will Greeks express a clear direction? Will they start the domino-like disintegration of the Euro? Will they provide an example other European countries will follow? Sunday’s election in the birthplace of democracy will tell. On the Road Again, Nelson! 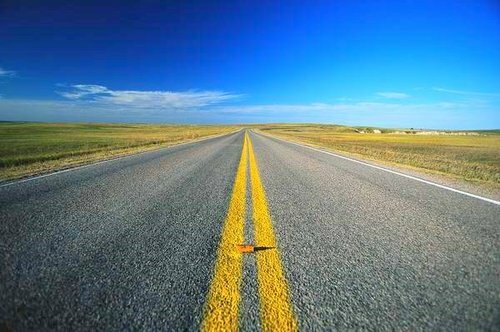 I used to drive with the window down, my left arm resting on the door. Never had air conditioning in those days. Summer or winter, the rolled down window was all there was. Always had a cassette player, though, so I could blast the Doobie Brothers, Jimmy Buffet, the Crusaders, Weather Report, Bonnie Raitt, or whatever else I was listening to at the time and sing along. Echoes of love are started all over. 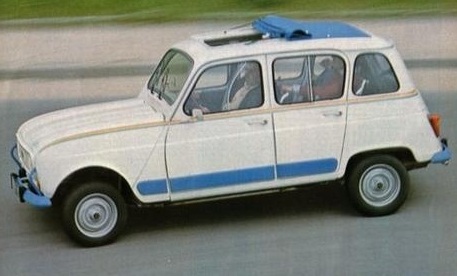 Something like 30 years ago, I had a teeny, white Renault. Never went very fast, even going downhill. Got blown around a lot by big trucks on the freeway. In their rearview mirrors, I could see the drivers laughing as they passed. I guess they didn’t see many Renaults in North Carolina. Could also have been because I had a license plate that said “SLUG.” Or maybe it was because you didn’t often see big guys like me driving little cars they could barely fit into. I suppose I should have given them the benefit of the doubt. The light turned green and he took off laughing. It was a honey of a car, though. Still maybe the best I’ve ever had. Reliable. Great gas milage. Easy to work on. 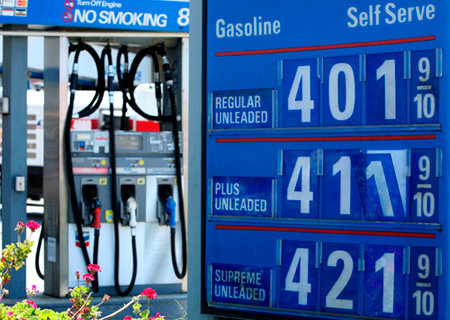 Once replaced the gas tank by myself; wouldn’t dream of even trying it with my current car. Couldn’t go fast, but it did make it cross-country more than once, packed floor to ceiling with all my worldly possessions. Truth is, I’d probably still have it if it wasn’t totaled by a drunk driver one night. I saw it for the last time, there amidst the auto ghosts on Pier 40, where they towed it after the accident. Folded up like a little, white, French accordion, my hand to God. Many years ago, I met a guy about my age who was visiting mutual friends in the US from South Africa. He was studying architecture and we walked around Washington, DC together, pretty much looking at statues and buildings. He remarked that, compared to the other world capitals he’d visited, DC’s buildings were the most self-consciously monumental, or something like that. He asked me why I thought that might be true. And I said I thought it was because, relative to European cities, we had such a short history, we needed to create purposefully the gravitas their capitals had by virtue of their longevity. “So, it’s to cover over your insecurity, then?” he asked. “Yeah, basically.” I replied. 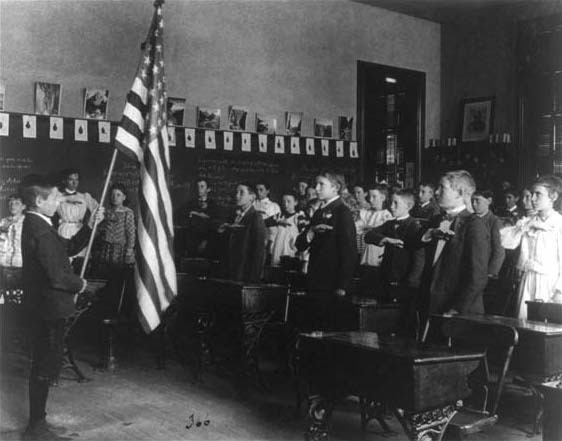 The pledge wasn’t adopted as any sort of nationwide standard until 1942. Since that time, the pledge of allegiance has undergone changes. The most significant being the addition of the phrase “under God,” as a contrast to “Godless communism,” in 1954. The salute has also changed since the early days. The earliest version I could find appears in the top photo (above). 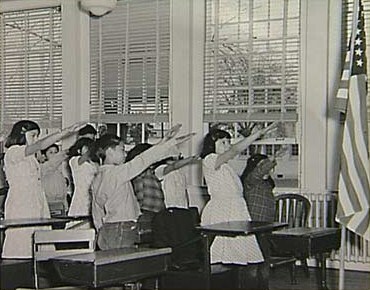 A bizarre Nazi-esque salute was used in the 1940s (below). Today, while those in uniform hold a standard salute, the United States Flag Code calls for civilians to hold their right hand over the heart. One might well ask why we Americans pledge our allegiance to a flag to begin with. I mean, specifically, why a flag? Why don’t we pledge our allegiance to the nation? The republic itself? Our form of government? Each other? Certain principles? Why a flag? A flag is a tangible thing. It is just dyed cloth. Thinking people can’t really pledge their allegiance to a piece of cloth. The flag, and not some more suitable abstract concept, was purposefully chosen by Bellamy as the object of our collective allegiance, because in 1892, the country, then less than 30 years after the Civil War, was deeply divided over very significant matters. Bellamy wanted to highlight a certain set of commonly held American principles without explicitly listing them because there wasn’t the consensus on them necessary to support a common list. One example: he initially included the term “equality” in his pledge but decided against it because the country wasn’t fully behind equality for people of all races. I believe we still use pledge to a flag today for much the same reason. If we pledged to a certain set of commonly-held principles, what would those be? These days, I can’t imagine reaching any level of national consensus on much. So, we’ll continue this bizarre practice of swearing our loyalty to cloth. And yet, because of our national insecurities, of which there are legion, we cling with a death-grip to anachronisms like the pledge, and simultaneously use it like a war club to attack those who don’t publicly exhibit adequate patriotism. The pledge of allegiance has become little more than the equivalent of the red, white and blue Dacron bunting that gets unpacked on holidays to festoon sales at shopping malls. I suggest we scrap it now and have a real national dialog on what matters: what it really means to be an American and what we stand for as a people. I’d pledge allegiance to that. A small eternity, a sonnet self-contained in rhyme. 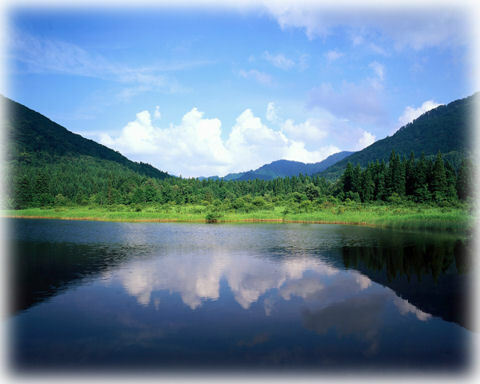 Escape from the weekday time. Which deadens and endures. 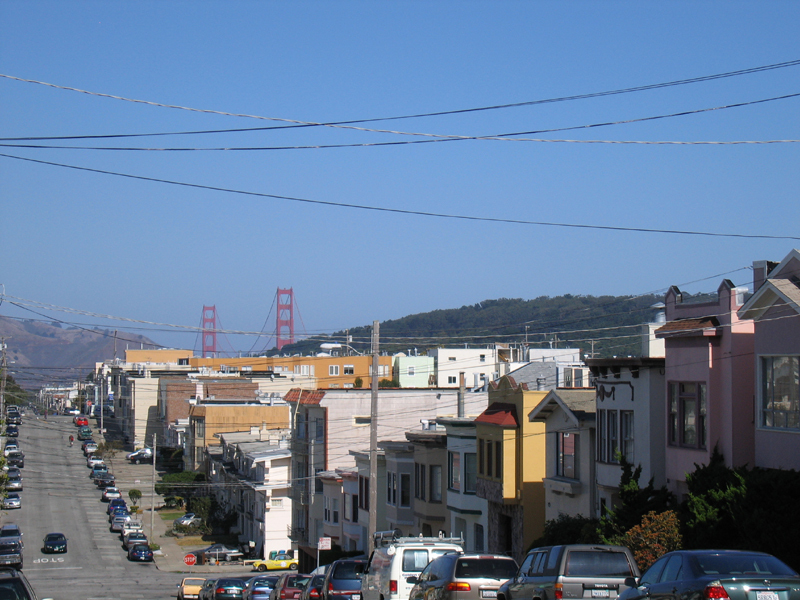 I grew up in the 1960s, a typical kid in one of San Francisco’s many typically middle class neighborhoods. Corner grocery stores, kids listening to baseball on the radio, playground sports, dads at work, moms at home. We knew most of the families in our part of the neighborhood, some by sight, some more intimately. Most of the kids in my neighborhood, and there were lots of kids, went to either our nearby public school or to the local parish school. After 12 years of school together, we got to know those families very well. Neighbors without kids were mostly kept on a friendly “good morning” basis. We had one neighbor named Anton Lavey. His daughter Karla was a classmate of Mike, my older brother, but because she didn’t play sports with us, we didn’t know her very well. Like a lot of our neighbors, Lavey was fairly quiet, maintained his home fairly well and kept mostly to his own business. Now, there were a few quirks, but that could be said of most of our neighbors. Lavey’s particular quirks, however, were, relative to our other neighbors, somewhat more intense. For one thing, he had a pet lion. Yes, an actual, grown-up, although trained and domesticated, lion. He’d walk it around on a leash from time to time. Lavey also had a clean-shaved head in an era when such things weren’t as common as no-fat decaf lattes. His goatee was trimmed and pointy. He always wore black; head-to-toe black. Sometimes, he’d even wear a black cape, lined in crimson red. His house was black, from the walls to the front gate to the window frames. His picture would be in the newspapers or on local TV every once in a while, as one could imagine any hometown eccentric’s would. Oh, I guess I forgot to mention that he also founded the Church of Satan. Yeah, that was our neighbor, Anton Lavey, the High Priest of Satan. Before he died, in 1997, he was visited by a very long line of pilgrims who came to his house from across the globe; people from Marilyn Manson to US presidential descendant Chester A. Arthur III. 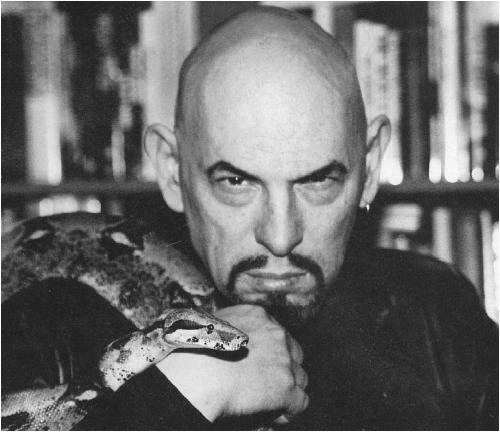 Anton Lavey, just another guy wandering around my neighborhood, you know, with his pet lion on a leash. As far as energy use, we Americans have had a pretty appalling record during the modern era. We use more energy per capita than any nation on earth; we are coming very very late to the conservation, renewables and sustainability party. And Republican candidates for president have lately provided no signs of easing off of their “drill, baby, drill,” use-not-save, red-meat mentality. If true, is this the sign of a positive change in Americans’ consciousness or just a pre-summer, pre-election blip? 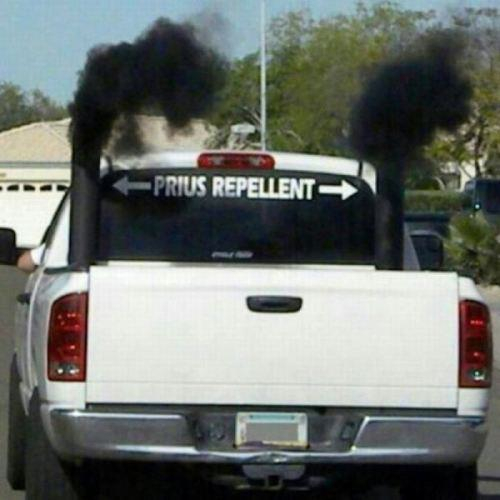 It’s hard to know, but I’ll remain skeptical as long as I continue to see idiots like this (see below) on the road.